The number of decks only goes up to 4+, so I’m not sure if this calculator is perfect, but it’s a nice resource to use as reference and more accurate than generic cards. Did Charles Barkley Lose $100K Gambling For A Few Hours? Greenbrier Resort opened this past weekend in West Virginia and they threw a star-studded party where they paid some famous people up to $100,000 just to show up. A mix of sports icons and entertainment stars — Jennifer Garner, Ben Affleck, Jessica Simpson, Brooke Shields, Lionel Richie, Charles Barkley, Shaquille O’Neal, Jane Seymour, Debbie Reynolds, Raquel Welch, Tom Watson, Jack Nicklaus — showed up Friday night at the luxury resort in West Virginia. Celebrities seems to matter to some people. I’ve met enough to be not be phased by their stardom. Anyway, one of the celebrities in attendance enjoyed the casino a little too much. The only real player of the night was Barkley. “Blackjack, roulette, craps — I play it all.” We spotted the basketball great in the high-roller section a little after 11 p.m., sitting next to (Jim) Justice and Shields at a blackjack table with a rack of $50,000 in $500 chips in front of him. Justice was casually tossing $100 chips in front of Shields. “I can’t play,” he said. “All I can do is help.” He left shortly after, but Barkley wagered until about 2 a.m., rumored to have lost all the money — if it was even his, or part of his appearance fee. Whatever. What he chooses to do with his money is his call. I always like to think that the money someone else is playing is their equivalent to mine. So if someone is gambling a $100 chip I like to think that it’s their equivalent to my $10/$25 chip. Truthfully, I don’t care what how much other people gamble. It’s not my business. Enjoy yourself, Chuck. The time has come for advertisers to find another way into your head. It was only a matter of time before idle slot and video poker machines at your favorite casino had ads running. Enter Reel-TV, a Henderson company that has patented technology enabling television ads and other marketing messages to appear on slot machine video screens while not in use. Last month, frosty bottles of Bud Light began materializing on video poker screens inside the main entrance of the Palms, like hallucinations induced by the desert heat. Over the past few years advertisements have popped up in almost every free space marketers can find. No area is sacred anymore. This shouldn’t surprise anyone. Like TV’s in supermarket lines, I expect to see this spread rapidly, so get ready for ads and casino promos everywhere you look in a casino. Damn, that’s slow drive across the Las Vegas strip in traffic gets billed at $30 per hour!? I’ve never realized that before. Thankfully insane cab fees are going to be reviewed next week. When cabs slow to less than 12 mph, wait time is assessed at $30 an hour, or 20 cents for every 24 seconds the cab is stopped or running at the low speed. Another major issue being looked at next week are “long hauls” from Mccarran Airport to strip hotels. 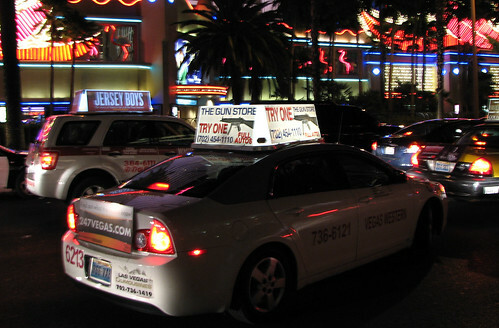 Long-hauling occurs when a customer hires a taxi at McCarran International Airport, usually asking to go to a Strip or downtown location, and is taken there by way of the airport connector tunnel. The Taxicab Authority has regulations prohibiting the practice, but there are exceptions that allow drivers to take their customers the longer, more expensive route. Cab drivers always get angry when I tell cabs at McCarran to please avoid the tunnel. Some get upset because they won’t do that and some because they want to make a quick buck. I hate having to do that, but it’s worth remembering to save a few bucks to buy another drink. In general cab drivers don’t mess with me when I tell them I’m from New York, but I’m sure I’ve been taken out of my way for no reason. Hopefully the zoned fare proposal and other ideas are seriously looked at so that the cab drivers can’t take unsuspecting tourists on a ride that costs them way more than it should. I was checking the 2010 NBA Draft Prop bets last night and found some interesting opportunities and figured I’d share them. I love the NBA draft because it’s right after the end of the season and followed closely by free agency. This is the time where the losing teams get ready to turn things around for next year. I find building the team as much fun as playing the season. Odds are from sportsbook,com. click any prop to get to sportsbook. The Las Vegas Sun is reporting that $1.2 billion in construction permits for Fontainbleau were pulled earlier this month. The permits listed a variety of projects, including casino, hotel and restaurant remodelings, miscellaneous commercial structure work and parking structure modifications. All the permits were issued June 10 and the total value of all 47 permits exceeds $1.2 billion. Representatives of Icahn Enterprises and Taylor International did not return calls clarifying whether there are any plans to resume construction at Fontainebleau..
I’m not sure that the market needs more room supply, but there may end up being room for Fontainebleau. Carl Icahn seems to keep his hotel and casinos in the mid-level price range. Most of the new casinos/hotels built over the past few years are high end, so Fontainebleau wouldn’t likely be direct competition. This looks to be a forward looking move as construction likely wouldn’t be finished for another 18 months or so. I wouldn’t imaging construction would start in the summer, but ya never know. Some love and some hate CityCenter. It’s a big monolith on the Las Vegas strip. There were such high hopes for this mega-complex to do well, but the poor economy doesn’t seem to be allowing it. One of the features of CityCenter was the ability to purchase condos at the heart of the strip in either Vdara, Mandarin Oriental or Veer Towers. CityCenter is fairing “well” relative to general condo sales in one of the hardest hit real estate markets in the country. Grant Govertsen of Union Gaming Group says CityCenter has closed sales on nearly 200 of 2,400 available units, with total sales of $185 million. Govertsen says CityCenter has closed an average of 33 units per month, well ahead of the market average of four units per month. This isn’t really good but, I guess, relative to the rest of the market you can say it is. I have to imagine that most of those 200 sold were sold to investors looking to flip the condos and were forced to hold on to the condos since the market is so weak. Expectations were so high for CityCenter that, unless all of the condos were sold by grand opening opening, there really wouldn’t be any satisfied onlookers. At this pace condos will be sold out in 2016. Hurry if you want to get in on the action.